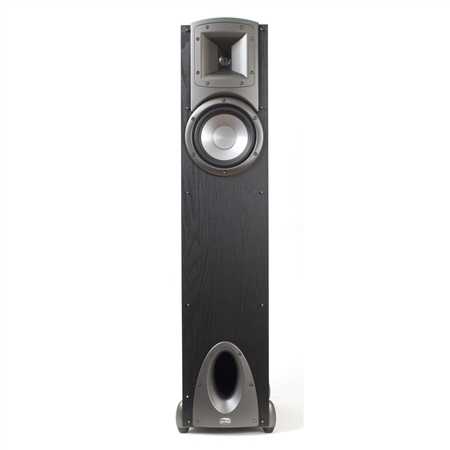 Delivering a style and sound that goes beyond anything listeners could imagine at such a reasonable price point the Synergy Series F-1 floorstanding loudspeaker takes the high-performance standards of the F-2 and puts them in a smaller and more affordable package. This third generation Synergy floorstander benefits from more than 55 years of Klipsch engineering experience and aesthetic upgrades that are representative of a new quality of craftsmanship. The F-1's virtuosity comes from its 6.5-inch IMG woofer and 1-inch aluminum-dome compression driver coupled to an exclusive square Tractrix® Horn. It also features a custom sculpted port that is located on the front baffle near the floor for intense low-frequency extension. The F-1 offers bi-wire capabilities allowing the use of one or two speaker level inputs as desired for improved connectivity. Available in a black finish with titanium accents the contemporary look of the F-1 is two-fold. With its grille on the F-1 offers a sense of elegance that nicely blends in with your home décor but take the grille off and you get an aggressive and powerful statement that exudes extreme performance.